OK, I’ve always believed that Bach had it over Mozart because Back was more spiritual and emotionally deep. 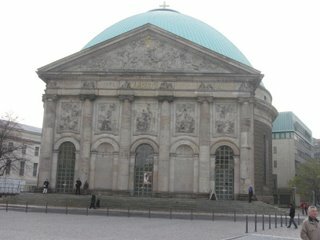 Well, on Sunday I attended Mass at St. Hedwig’s Cathedral, a very German Catholic Church near the hotel in what was East Berlin. To say the Cathedral was “spare” is an understatement. It had the decor of a Quaker Meetinghouse. No statues, no artwork. Just a simple alter and had wood and wrought iron pews. There wasn’t even any cushions on the kneelers. These Germans are tough. Other other hand, the choir was magnificent, probably the richest, most beautiful choir I’ve ever heard in a church. 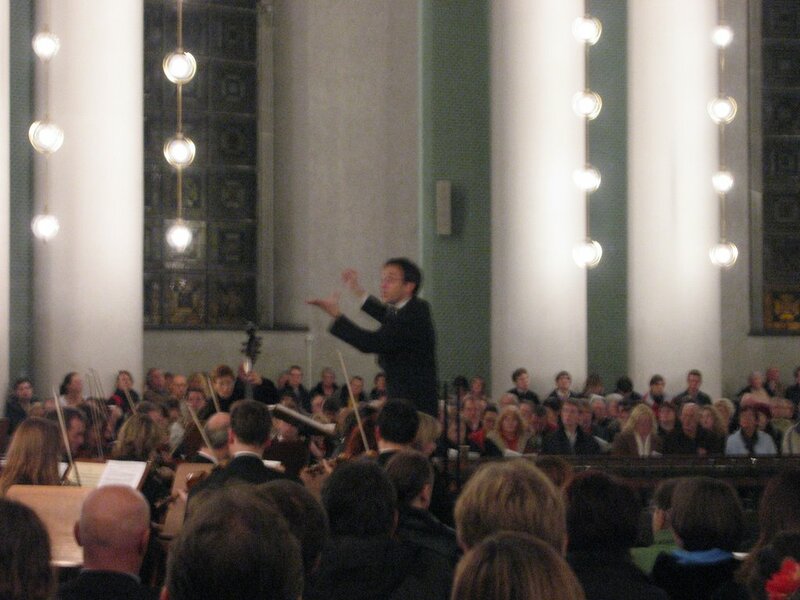 A poster announced that there would be a performance of Mozart’s Requiem that evening. So, I trekked back to the church that evening through an appropriately gloomy, rainy evening. The performance was breathtaking. This is a piece that Mozart composed as he was dying at the age of 35. While it was commissioned by a mysterious figure who visited Mozart dressed in grey, the story is that Mozart was very aware of his own mortality while he wrote. So, the spiritual depth was every bit as present as in Bach’s music. The piece alternately violent and sombre, but stunning throughout. So, as we reached the conclusion of the piece, I was anticipating the rapurous applause that would ensure, of which I would be an enthusiastic participant. After the last note was played, you could hear a pin drop in the church. I had the sense that everyone was holding his or her breath. The conductor stood still facing the orchestra and choir for an extended period. Then, he turned and bowed slightly to the audience. Audience members quietly shuffled to the feet and exited the church quietly. I was amazed. Not one errant hand clap. Apparently, Germans don’t clap in church. It was wierd.